A wind stress is applied to the surface of a stratified and a non-stratified tank to cause mixing. This is a pretty impressive experiment to run if you have a lot of time, or to watch the time-lapse of if you don’t. The idea is that a density stratification will make mixing harder than it would be in the unstratified case, because more energy has to be used to break up the stratification. To look at this, we ran two experiments, one after the other. In the first one, we took a tank full of freshwater, added dye droplets and switched on a hair dryer, set to blow pretty much along the surface of the tank, to force mixing through the wind stress. After about a minute, the tank was fully mixed. 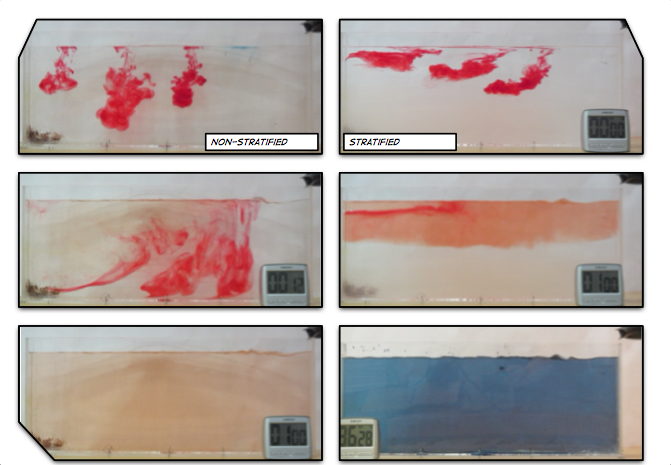 In the second experiment, we created a density stratification: salt water with approximately 35 psu, and freshwater. We then added the dye droplets. The droplets never penetrated into the salty layer but instead layered in at the interface between the two layers. (See how there are internal waves on the interface, which is why the dye seems to penetrate much deeper on the right? If you watch the movie at the bottom of this page, you see the internal wave very clearly) We then added the hair-dryer wind stress. After a minute, the surface layer was well mixed, but there was no mixing penetrating into the bottom layer. (We added blue dye at some point, which makes the picture below a little confusing.) To fully mix the whole depth, the wind forcing ran for 86 minutes (and I am proud to report that my hair dryer survived this ordeal! Don’t leave this experiment on its own, not every hair dryer might make this without catching fire!). Mixing in a non-stratified tank (left) and in a stratified tank (right). See the stop watch at the bottom of the panels for an impression of the time scales involved! This is a great demonstration of how mixing is inhibited by stratification. We had expected to see a difference, but we were really surprised that the difference was so large. Of course, the stratification in our tank was pretty harsh, but still. Watch a short movie below and a movie containing the full time lapse even further down! P.S. : This text originally appeared on my website as a page. Due to upcoming restructuring of this website, I am reposting it as a blog post. This is the original version last modified on November 27th, 2015. I might write things differently if I was writing them now, but I still like to keep my blog as archive of my thoughts. This entry was posted in demonstration (easy), tank experiment and tagged density, mixing, stratification on August 1, 2018 by mglessmer.